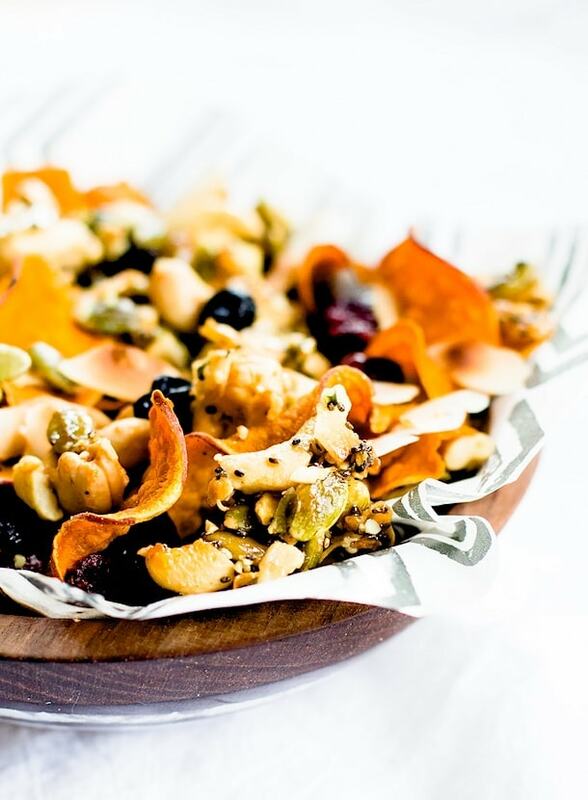 Homemade party mix – the common thread of all summer picnics, holiday parties, and road trips. My mom’s rendition of this classic is one forever etched in my mind, and on my tastebuds. She didn’t hold the recipe hostage, giving it out to those who requested, but theirs never tasted quite the same. Maybe it was her roasting technique, the nuts perfectly crunchy and the cereal always golden brown. Or a heavy hand when it came to adding the salt and Worcestershire. Or the fact that she always used Chex & Crispix, never the store brand because “they just weren’t the same.” Smart woman. And my favorite part? The high nut to cereal/pretzel/bagel chip ratio, specifically cashews. They brought natural sweetness to the savory party. 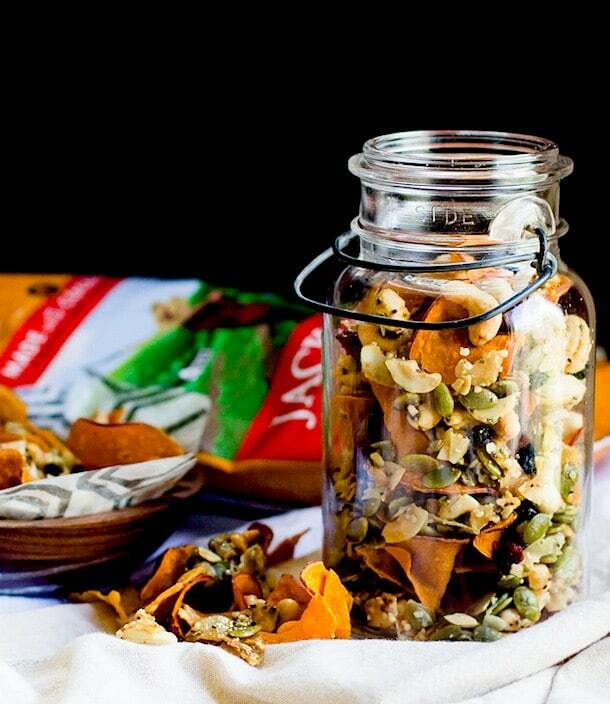 With a hankering for something similar, yet more whole foods & nutrient-dense based, I went to work developing my own, which came to be this Honey Nut Cluster & Sweet Potato Chip Snack Mix (that just so happens to be paleo too). I envisioned something salty and a little bit sweet, with different textures, yet grain-free. 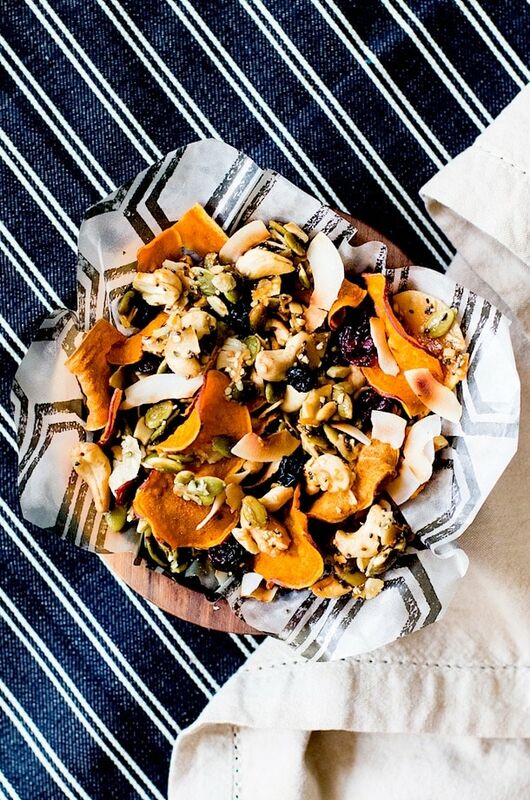 Nut clusters reminiscent of chunky granola came to mind, and coconut oil sweet potato chips (so.so.good.) were a must. After several iterations, I landed on this blissful combination. Getting the nut and seed clusters to clump together without being too sticky was the tough part, although I didn’t mind eating the “not good enough” batches. 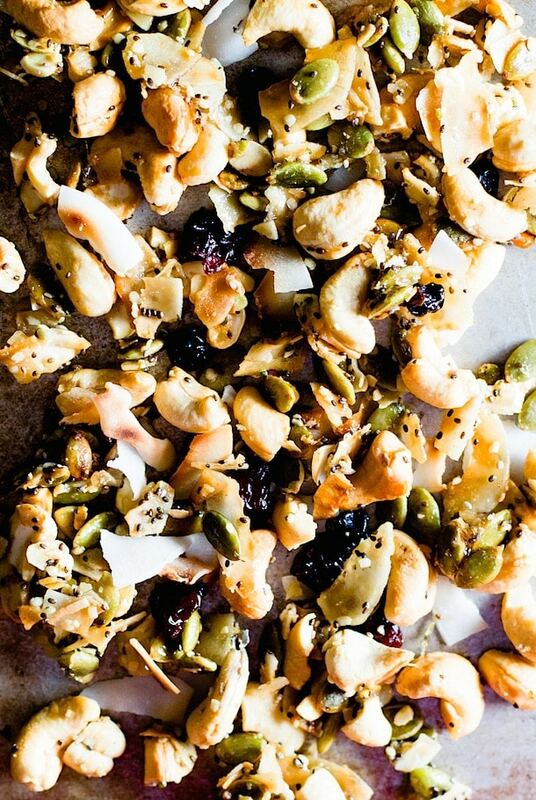 Give me a blend of flaked coconut, cashews, pepitas, and chia seeds anytime…. 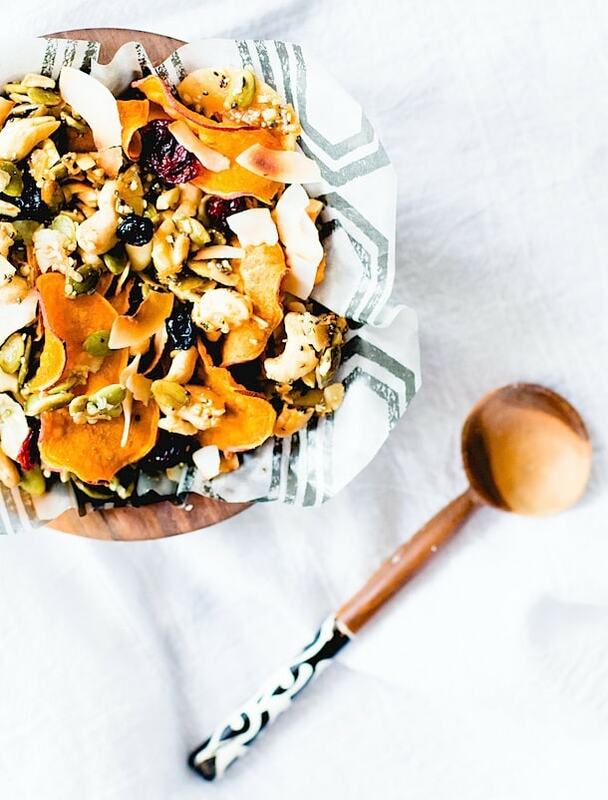 Roasted with coconut oil and a touch of honey, then tossed with dried berries and sweet potato chips, I have to say this healthy mix is hard to resist. We’re talking good fat and protein from the coconut, cashews, and seeds, plus the antioxidant powers of the fruit. And after learning that my body needs carbohydrates more than I thought, the sweet potato chips are irreplaceable. 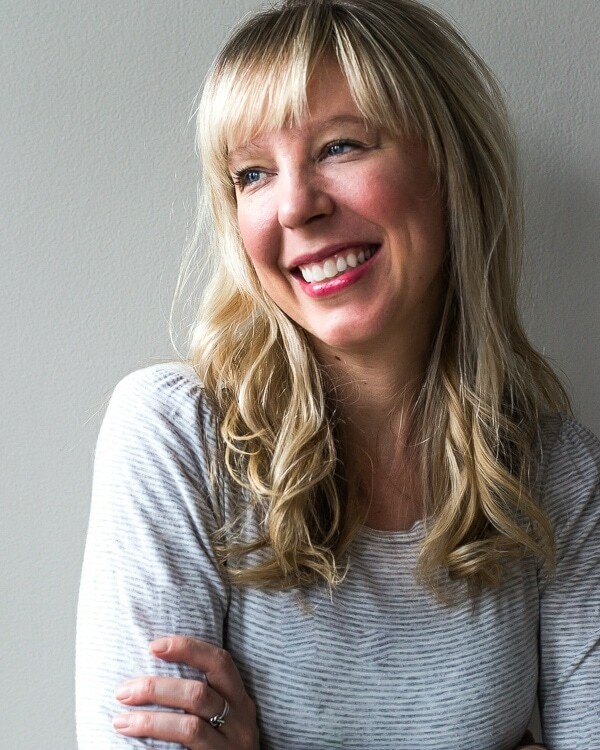 Many of you know that part of why I write this blog is to share the real stories behind real food. I found Jackson’s Honest Chips while going through my autoimmune issues, as it was one of the only minimally processed, packaged food i could find. Scott & Megan started the company as a result of trying to improve the quality of life for their son, who was born with a very tough, undiagnosed medical condition, through nutrition. They embraced a philosophy of eating simple; to eat nutrient dense foods as close to their original state (that is, unprocessed) as possible, fermented foods that are more easily bio-absorbed, and ‘good’ fats. On a whim they started making their own potato chips fried in coconut oil, as they were frustrated by all the others on the shelf cooked in highly processed vegetable oils. They couldn’t believe the difference in flavor – rich, deep, and aromatic. And with my first taste, I was in love too, another reason I am so excited to partner with them for the remainder of the year. At every step of the production process they do what’s right for the consumer, farmers, environment, and their employees. Their products come from the field, the farmer, and the fryer…to you. After the success of the potato chips, they began making sweet potato chips and recently launched organic tortilla chips, also fried in coconut oil. They’re all incredibly delicious, and if you haven’t tried them yet, I highly suggest getting your hands on some. You can find them at Whole Foods, or locally at Lakewinds Coop. I’m off to a Saint Paul Saints game on this glorious summer night, and I’d be lying if I said a bag of this mix wasn’t tucked into my purse. But whether you’re traveling, barbecuing or need an afternoon energy boost, enjoy this feel-good, taste-good mix. Roast for 10 minutes, stir, then roast another 7-8 minutes, until coconut flakes and cashews are golden brown. Remove from oven and very lightly stir in berries. You want the mixture to be in one large heap so that as it cools, it sticks together. I love this! All my favorite things in one mix. I’m going to have to get my hands on those sweet potato chips too. Hope you had fun at the game! xo. Oh goodness, this looks lovely Amanda! I always hate when snack mixes have some good and some meh pieces, but this looks all over perfect! What a fabulous snack mix! Anything with cashews and sweet potatoes ;) Perfect! I couldn’t keep my hands out of the jar! Oh my, this sounds so good! I’m adding this to my must-make list for my next road trip! This sounds like the perfect snack. You’ve included all of my favorite treats. Pinned! The color and flavor combination looks out of this world, I’ve already pinned it! Yes, and I love all the different textures too! Thanks for stopping by and sharing Celeste. 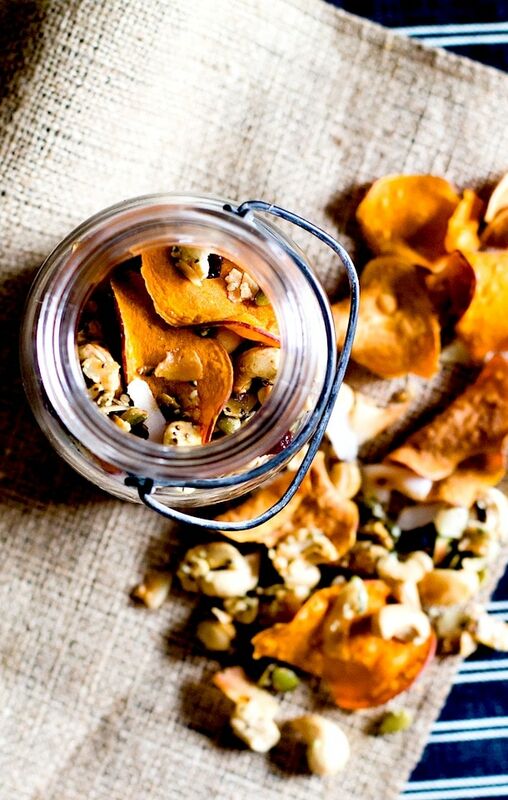 Love the sound of those sweet potato chips and adding them to trail-mixes — I’ll have to look them up! This looks awesome! I love Jackson’s Honest brand, and the combo of sweet potatoes, cashews, and berries sounds absolutely perfect. You have a great combination of goodies in your trail mix, and I’m totally sold with the addition of sweet potato chips :) Pinned! I love the sound of this – the addition of sweet potato chips is so smart. sweet potatoes have to be one of the most versatile vegetables ever. love them so much! I love this unique twist on snack mix. The addition of sweet potato chips looks fantastic. I am definitely going to have to give this a try. Pinned! aw, thanks for sharing Danielle! hope you’re having a great summer. Ah, testing and retesting to get it just right. I appreciate that Amanda and no doubt, it is, just right. I’ve never seen anything like this before and am so excited to start poppin this snack in my mouth. It is completely mouthwatering and something that needs to be in my belly ASAP! Really appreciate Enjoy Life foods too. A high integrity company. Thank you for this, my dear! Gorgeous!! Who does not love a nice carry around snack? Who am I kidding, I’d eat this on the couch and not even make it into my purse. Looks so scrumptious, Amanda!! Love the pun :) Thanks for stopping by Todd – I will definitely be packing it along the next time I make a trip out to CA to see all you awesome peeps! coconut rocks my world too! ooooooh man. this is so fabulous. i love this idea! this is basically all of my favorite crunchy sweet things all rolled into one perfect party mix. I thought I had commented on this one, but I guess I didn’t. Anyways, this looks incredible, Amanda! I love the sweet potato chips mixed in. So brilliant!